It seems like only yesterday (actually it was only yesterday) that a friend stopped to ask, “Did you go see Ruth Reichl at Third Place Books the other night?” I hadn’t. She was there, representing Gourmet as its longtime editor, promoting the 68-year-old magazine’s latest cookbook. And now comes news that there’s truth to the rumors I’ve been hearing: Gourmet is one of the magazines on Conde Nast’s chopping block. What a sin and a shame — as my friends and other food lovers across the country are reporting this morning. What next! Gourmet is no longer the apple of Conde Nast’s eye. I’ll miss it. We have now completed an extensive review of our business – an important undertaking given the dramatic changes in the U.S. economy. The review has led us to a number of decisions designed to navigate the company through the economic downturn and to position us to take advantage of coming opportunities. Conde Nast’s success comes from the ability of our publications to attract readers with a wide range of interests, as well as advertisers who value them. But in this economic climate it is important to narrow our focus to titles with the greatest prospects for long-term growth. 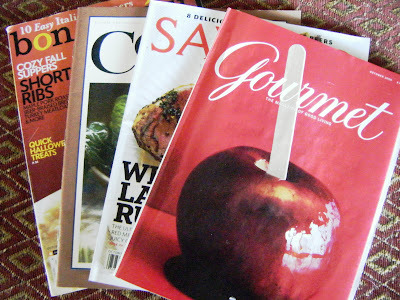 Gourmet magazine will cease monthly publication, but we will remain committed to the brand, retaining Gourmet’s book publishing and television programming, and Gourmet recipes on Epicurious.com. We will concentrate our publishing activities in the epicurean category on Bon Appetit. Conde Nast is now in its 100th year of creating the most respected and iconic brands in the publishing world. These changes will ensure that our unique publishing company will continue in its preeminent position for many years to come.